. . . 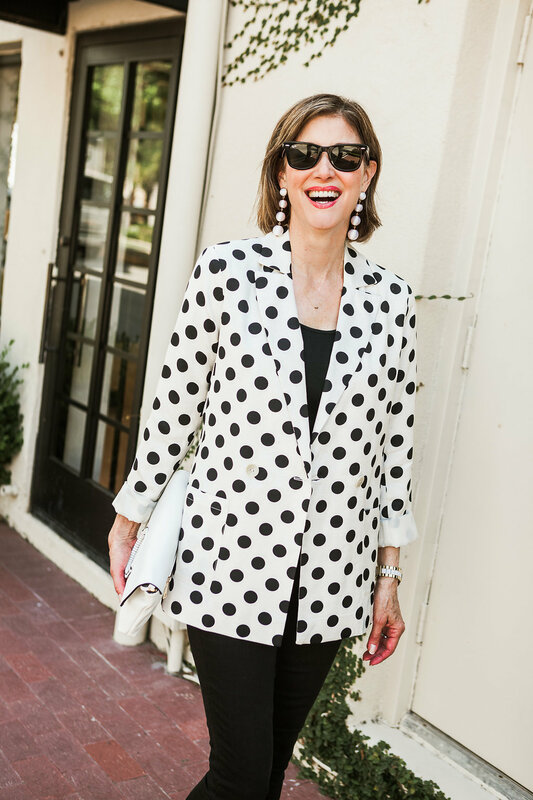 Dot, Dot, Dot - Fashionomics "every page"
I have to say that I love black and white dressing. You just don’t have to do much to look very chic. 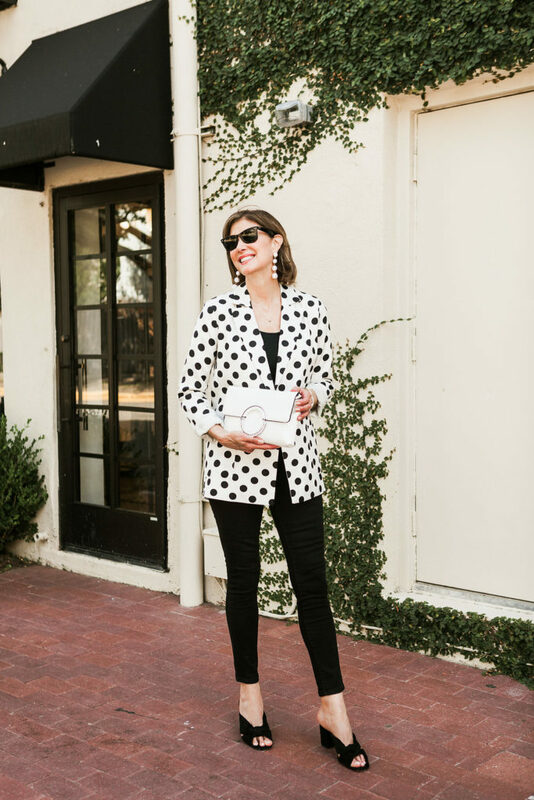 Mules are a huge trend and a clutch is always a great choice. 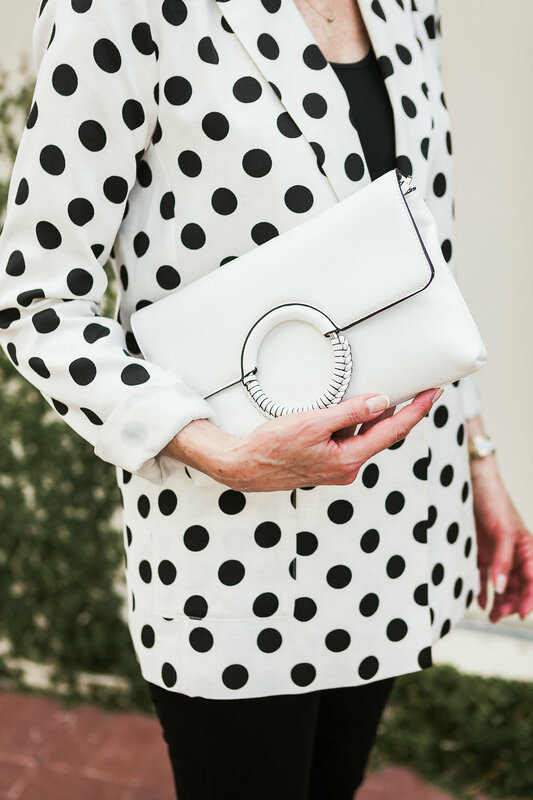 I think this white clutch with black trim from Sole Society is so great looking and it comes in 4 colors – black, white, ginger spice and blush (($49.95). If you follow my blogs you will notice that I don’t have a lot of sunglasses and mainly wear these classic Wayfair Ray-Bans. They fit my face and when my purse was stolen I thought they were gone, then I was so happy to find them on the floorboard. Yay!!! I wish mine were polarized, I’ll upgrade soon but I just thought all Ray-Bans were polarized!! I think that I have told you before that I have come to the conclusion that trends don’t go away too fast these days. They seem to roll over from season to season and the most extreme trends take longer to catch on for more conservative types like me. 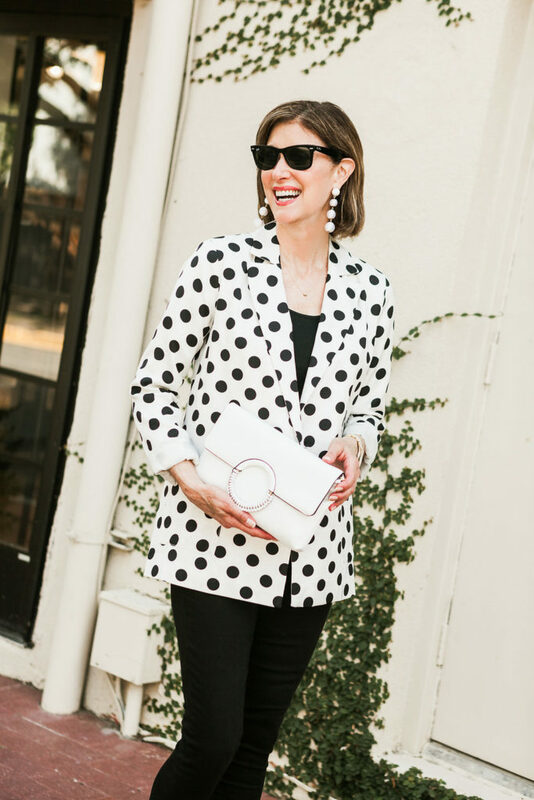 So I feel quite sure that polka dots will continue to be a trend in the fall but I am sad to say that one of my favorite accessories, the ball drop earring seems to be on the way out. Too bad for me because I have really enjoyed mine (I have so many pairs in lots of colors) and still wear them all the time. They seem to be replaced by fringe and other large earrings that are also lots of fun. But I just had to wear them with this – Dot Dot Dot. (remember from Mama Mia – “We danced on the beach, and we kissed on the beach, and … dot, dot, dot.” I’ve included a few more of my fave polka dot looks on my Shop the Post. PS – If an item is ever low in stock online (like my black mule – the sizes are going fast) you can always try the store. Sometimes the hunt is worth the effort. 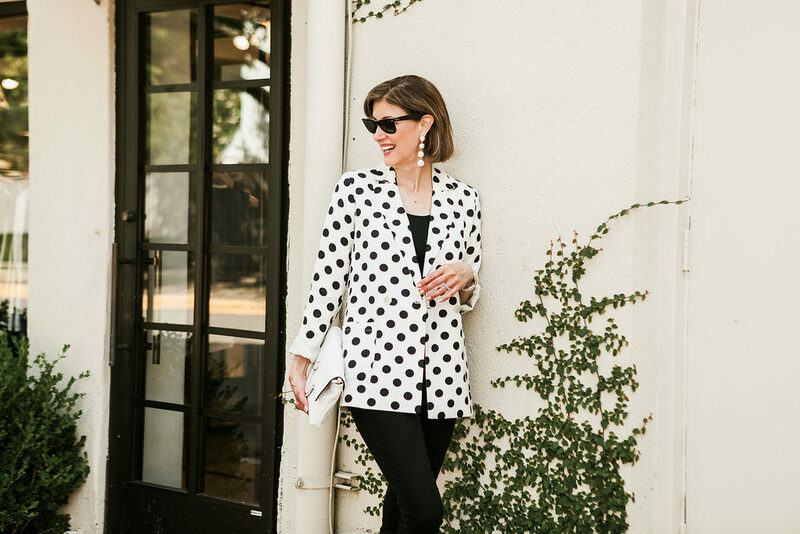 You can always google the brand and see if it is available at another store like Macy’s, Dillard’s, Lord & Taylor, or Bloomingdale’s because a lot of the retailers carry the same designers. This is such a playful yet polished look!